There's no denying why this play now. Church & State by Jason Odell Williams is more than relevant in our political climate. The political comedy playing New World Stages may not be radical, but it's the manner in which it is presented that makes this play important today. In the heart of Red State America, Charles Whitmore is running for Senate re-election. With only a few days before the big day, Senator Whitmore is about to make a usual speech. Only he is preempted by a breaking story of him announcing his loss of faith and belief in God. It sends shockwaves to his team as his hard-nosed campaign manager Alex Klein and faithful yet kooky wife Sara try to fix the situation before he walks on stage and tanks his chances. So what causes this loss of faith? Another mass murder at an elementary school by a lone gunman. Aside from being a glimpse into the backstage of politics, Church & State is a play that continues the necessary gun control conversation. With a smartly comedic backdrop, Williams is able to explore the various sides on the debate of faith and gun control while keeping the action moving. The play is bold but in no ways is it perfect. While his use of comedy is blended well into the overall drama of the situation, some of his characters are a tad cartoonish. Perhaps just for comedy's sake. He paints the southerners as a bit backwards, especially through the running gag of "the Twitter," while the northerner is on point with reality. It's a comedic juxtaposition and lends itself well to natural comedy but causes some believability issues when the important issues arise. Arc wise, Sara goes through a drastic transformation by the end. But the election night antics of Sara and her pretzel bites was the humor filler for the beat, the aftermath may not have been the most believable. Despite the poles of comedy in the text, it’s important to have some. It’s easier and most successful to capture an audience’s ear when they have permission to laugh. Church & State is a conversation starter. The points he introduced are poignant. They have great weight. They may not be brand new but they’re important to the overall political narrative. Same tragedy, no new changes. Taking on the pivotal role of Senator Whitmore, Rob Nagle took the exuberance of the character and managed to bring out honesty and sincerity when it mattered. He stood firmly to his beliefs and helped to prove that anybody with a heart can change. As his wife Sara, Nadia Bowers tapped into Williams’ writing and ran with it, creating a character that was a scene-stealer. Bowers takes the silly jokes and makes them land hard. She has no fears on stage. Despite the drastic turn her character takes, Bowers allows it to feel as natural as possible. Channeling her best C.J. Cregg, Christa Scott-Reed as Alex was the brains inside the campaign. Putting the “ish” in Jewish, her Democratic Yankee campaign manager was wonderfully uptight and rightly wound up dealing with a pair of unpredictable personalities. Though mostly secluded to the editorial points of Williams’ script, Jonathan Louis Dent hammered home the essential points with ease and sublimity. Markus Potter directed the fast-paced dark comedy with great intent and mindfulness. 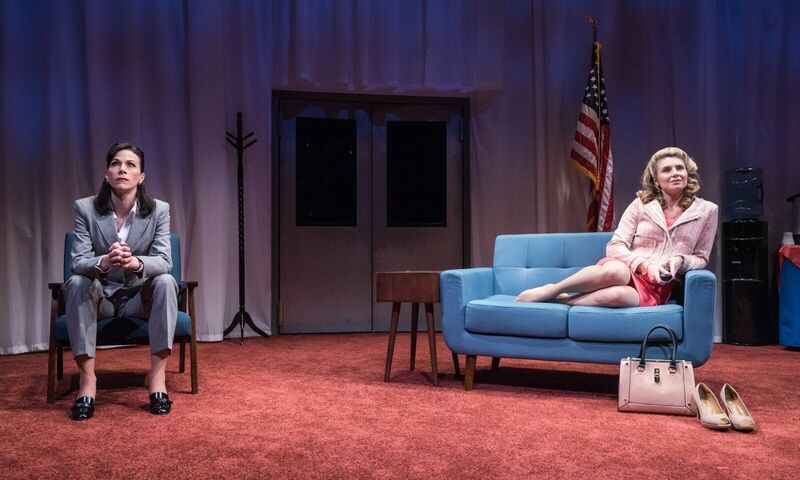 Church & State is filled with a big themes that was equally matched on stage through David Goldstein’s scenic design. It was America live on stage, as red, white, and blue seemed to be regurgitated in the room. It was comical to the point of being obscene. Goldstein placed some sort of scenic piece in every possible inch of the playing space, even the far extremes. Potter ensured that those pieces were touched even if it felt unnatural, especially bringing added light for the seldom moments. For the most part, sound designer Erik T. Lawson played with atmospheric sounds, most notably with the sounds of the unseen television screen. But you know you garner a powerful reaction when a, spoiler alert, a gunshot rings out and the audience cowers. It’s what the moment called for, bringing reality into theatricality. Church & State is a play that can easily travel around the country in hopes of making an impact while still entertaining. Regardless where you fall in your beliefs, Jason Odell Williams has written a play that continues the national conversation on gun control. You may not walk out of the show talking about the play itself but it will certainly get you discussing the topic. And that’s almost more important.